Ian Reynolds Discovered Armellodie through Yip Man, but the whole album makes great listening - very varied. My other favorite track is 'Under a Glass Table'. Eight excellent minutes. Will definitely be checking out more from Armellodie. Favorite track: A Modest Refusal. 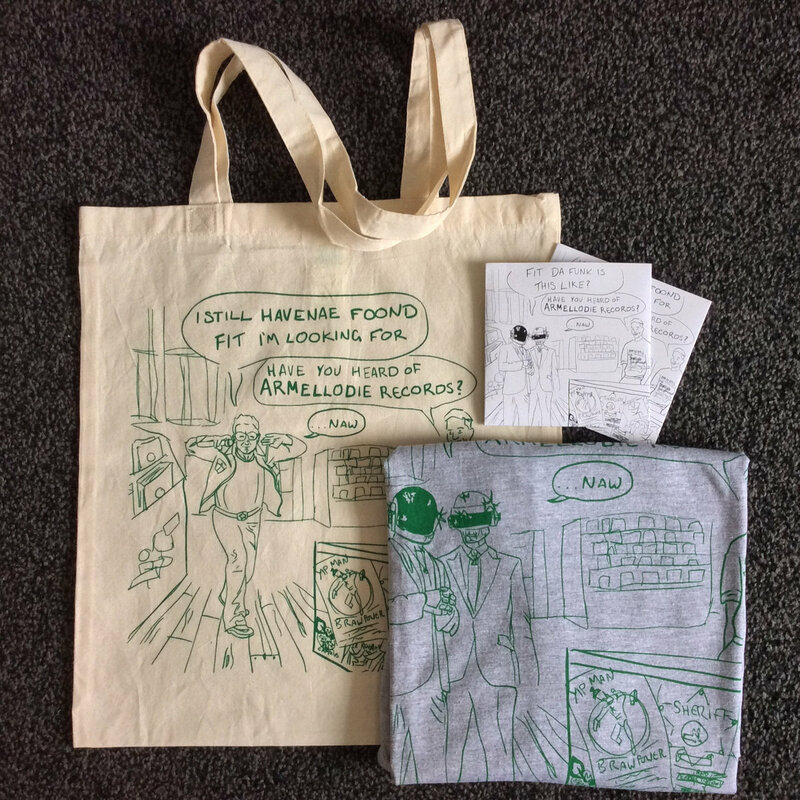 Armellodie is 10: T-shirt, Tote, CD! ALL FOR THE BARGAIN PRICE OF £10. WHILE STOCKS LAST! All artwork designed by Liam Duffy. T-Shirts are screen-printed onto Gildan Premium ring-spun 'sports grey' cotton shirts with a slim fit. 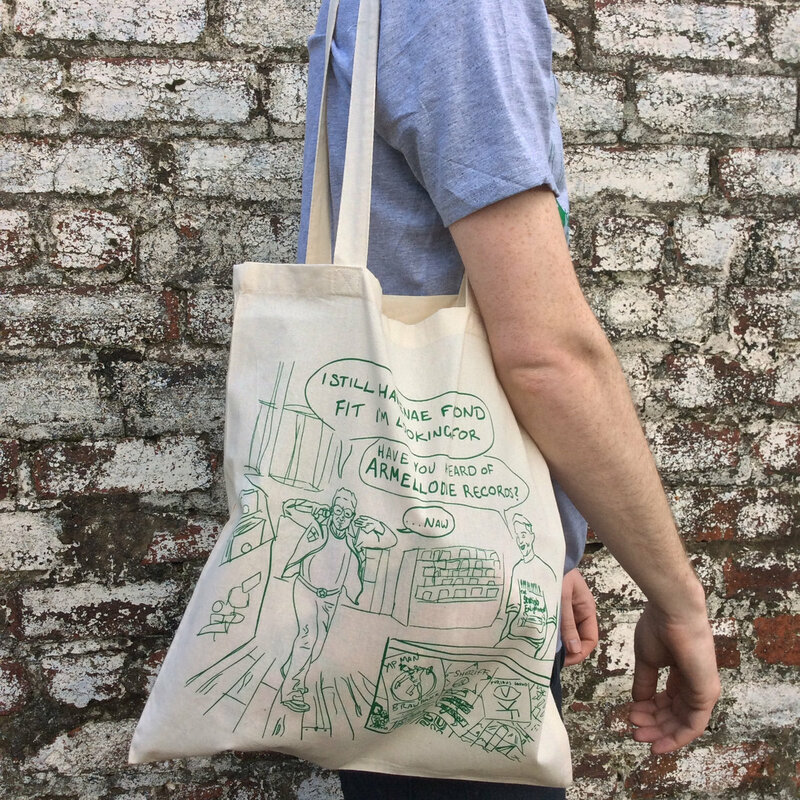 Tote bags are natural with Kelly Green screen-print. Dear Daft Punk and Bono, please don't sue us. We're still only wee. Stand-alone CD version of Armellodie is 10 with arwork by Liam Duffy. Comes in a card slipcase. Includes unlimited streaming of Armellodie is 10 via the free Bandcamp app, plus high-quality download in MP3, FLAC and more. It has been ten years since Scotland’s Armellodie Records first began to showcase its eclectic, haphazard approach to popular music. This here compilation is a celebration of a decade of meaningfully carefree shenanigans lovingly shepherded by Scottish indie workhorses Al Nero and Scott Maple. 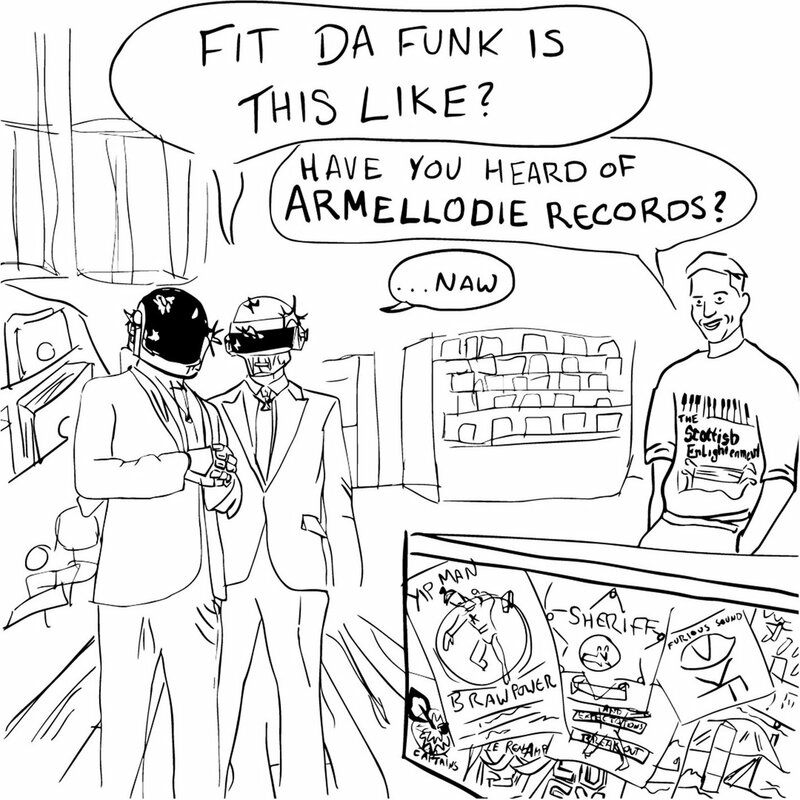 Armellodie is all of the things that a great indie label should be. It is first and foremost a project born of, and sustained by, the pleasure of creating something good. Maple and Nero never got into this for wealth or status, and as such they are willing to support and share the music that excites them over the music that has an obvious commercial appeal. This is good for us all. A fear of financial losses in the streaming age has the potential to take the wind out of many small labels’ sails and sees increasingly trend-led and conservative rosters. Fortunately for us, the world is full of such keen and unselfish people as our champions here and Armellodie alongside various likeminded collectives and DIY projects has become a home for the dishevelled and unusual. 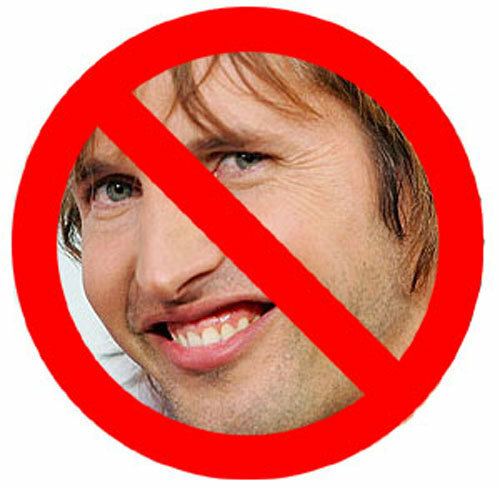 The unlikely pop eccentrics that form a partial antidote to the music that conforms more easily to today’s commercial sensibilities. The Armellodie roster is a hydra of different heads, from the pristine indie of The Hazey Janes to the mathematically challenging musical prowess of Super Adventure Club. From the project and concept driven Dan Lyth, The Douglas Firs and Thirty Pounds of Bone to the pure unhinged madness of Galoshins and Kill the Captains. Many aesthetics are tolerated in this camp and rightly so. The label’s non-idiomatic approach allows every release to feel fresh, and allows the Armellodie camp to avoid the stale and moribund notions of a ‘brand’. It is a great thing to have a place that stables The Scottish Enlightenment in all their thoughtful, crystalline density, but at the same time introduces the country punk eccentricity of Cuddly Shark or the expensive, trend resistant, blue-eyed grooves of supergroup The Pure Conjecture. 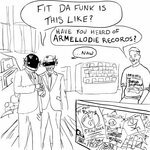 With recent releases by the terminally popular Yip Man, and the post structural satirists Bloke Music, Armellodie shows no signs of slowing down. This can only be a wonderful thing. This celebratory compilation gives a fragment from throughout the history of the roster and evidences the immense and diverse talent within. Sit back and allow the landscape to shift under you from the clockwork flawlessness of Something Beginning With L one minute to the spiky energy of Saint Max and the Fanatics the next. Take in the charm of Conor Mason, and be unnerved by Gastric Band. At the end find the bouncing pop gem of a song that began it all, that 7” single by Le Reno Amps. 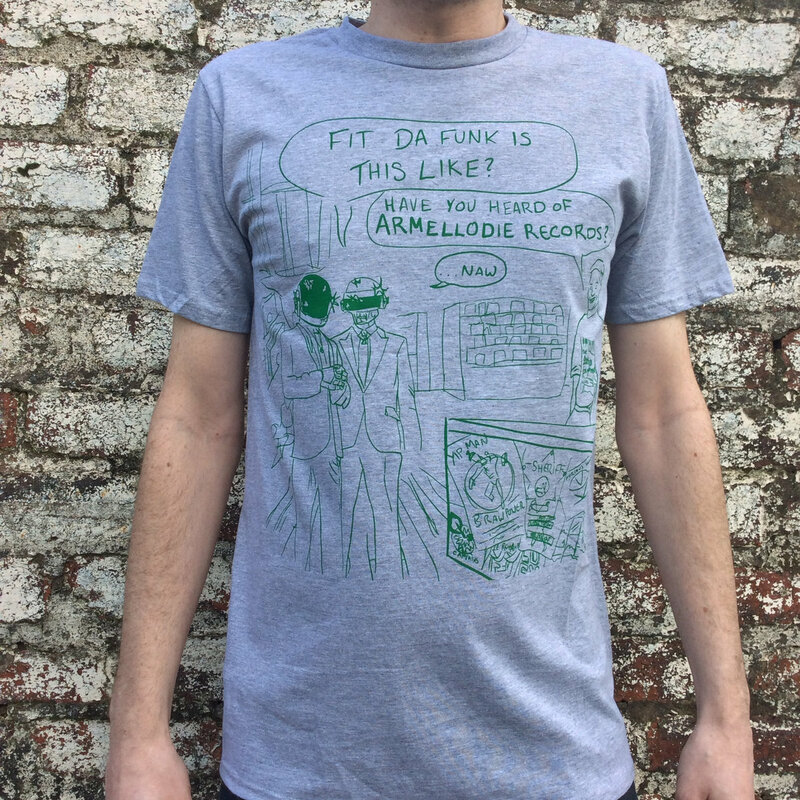 Armellodie is a tiny wee independent label, stable, collective, R.O.C.K consortium, based in Glasgow, Scotland.